A Kurosawa Celebration, From Many Angles A restored Rashomon and rarely seen sketches in the director's own hand anchor a three-month tribute to the man who brought Japanese cinema to the world. 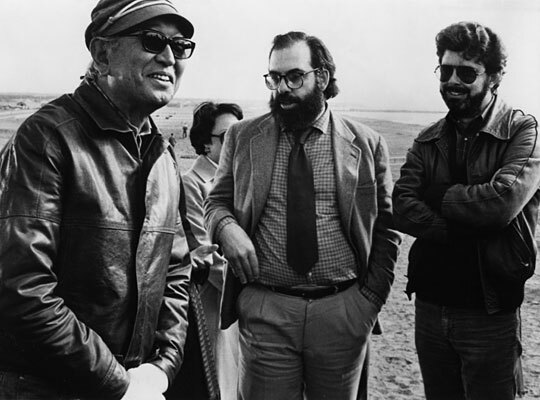 Akira Kurosawa (from left) with Francis Ford Coppola and George Lucas during the filming of Kagemusha. In 1989, the Academy of Motion Picture Arts and Sciences awarded an honorary Oscar to Akira Kurosawa, whose big-canvas, big-theme pictures helped bring Japanese cinema to audiences around the world. Now, the academy has launched a three-month tribute to the director, anchored by a restored version of Rashomon — Kurosawa's legendary study of truth, memory and perspective — along with rarely seen sketches in the director's own hand. 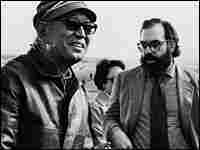 The latter are crucial: During shooting, recalls fellow director Martin Scorsese, Kurosawa would communicate what he wanted from cast and crew by showing them his renderings of specific scenes. More than 100 of those paintings and drawings are on display through Dec. 14 at the academy's Samuel Goldwyn Theater in Beverly Hills. The restored Rashomon screens in New York on Nov. 17.